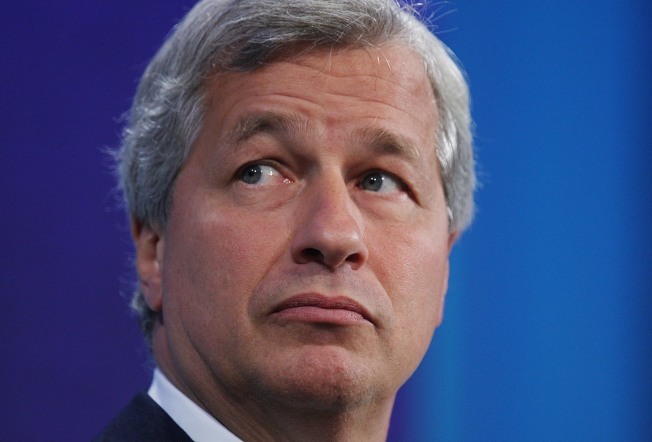 James Dimon, Chairman and CEO of JP Morgan Chase, which said it will continue to freeze student loan payments for soldiers on active duty. JPMorgan Chase, which already is under fire for overcharging troops on active duty, decided two months ago to end a program which has helped hundreds of service men and women by allowing them to defer student loan payments while on active duty, NBC News has learned. Chase’s decision to end the voluntary program came to light when the bank was contacted by the wife of a soldier serving in Afghanistan, and she was told the bank decided in December to stop allowing active-duty troops to delay paying their student loans. "They informed me that they are no longer deferring private student loans for active duty military personnel," said Kerri Napoli, whose husband, Army Pfc. Andrew Napoli, is now serving near Kandahar. "The first words out of my mouth were, 'How could you do that during a war?'" said Kerri Napoli. After repeated conversations with Chase, Napoli says she told the bank last month that she had contacted NBC News. The next day, she says, the bank told her it would grant her husband an exception to the new policy and defer his loan. The bank also has had second thoughts about ending a program aimed at helping U.S. troops with their family finances. After NBC News contacted the bank about why it had stopped allowing deferred payments, a Chase official said that decision was being reversed and the program would be reinstated. “Upon review, we have decided to reinstitute the loan deferment for all active-duty service members who request it,” said Kristin Lemkau, a Chase spokeswoman. Lemkau also said the earlier decision to stop providing deferrals applied only to new participants, and that troops already granted benefits would never have lost them. “As a policy, Chase tries to go above and beyond what is required in the Servicemember’s Civil Relief Act,” Lemkau said. She says she believes no other major banks even provide this kind of program for the troops. The Servicemember's Civil Relief Act is the latest version of a decades-old law that permits active-duty military personnel to postpone legal obligations such as pending trials or defer payment of some forms of debt. Chase officials acknowledged that, at the time the bank decided to end student loan deferments for active-duty military, they were aware of the mistakes in handling mortgages for the troops. They say the decision to suspend the deferment of student loans was made as part of an overall tightening of student loan policies. The Napolis' tussle with Chase began last summer, when Private Napoli called Chase to inform the bank he was going on active duty. He says the bank told him he'd be granted a one-year deferment on paying more than $50,000 in student loans. But in December, Napoli received a bill from Chase saying he had to start repayment in January to the tune of $404 a month. "It was horrifying to, out of nowhere, have a bill that was due," Kerri Napoli said. Kerri said when she contacted the bank for an explanation, Chase told her that her husband had been granted a six-month grace period after leaving school, but not the longer active-duty deferral he expected. The reason: He hadn’t sent in his military orders. Then, Kerri said, came an even bigger shock when Chase told her it had canceled the program totally. Kerri said the bank told her that her husband could get the loan deferred if he went back to school. "So it would have been deferred if he was safe in a classroom. But he had to go and serve his country and that was not good enough for Chase to go and defer his loan," Kerri told NBC News. Kerri contacted NBC News after reading about Chase overcharging troops on their mortgages, which may have violated the Servicemembers Civil Relief Act. Chase ultimately gave Andrew Napoli both a full-year active duty deferment and another six-month grace period. He will not have to make any student loan payments until March 2012. Chase has admitted that it overcharged thousands of troops and wrongly foreclosed on 14 of them. It says it’s refunding $2 million to families that may have been overcharged. It also said that most of the families improperly foreclosed on have gotten or will get their homes back. Rep. Jeff Miller, R-Fla., chairman of the House Committee on Veterans Affairs, says his committee has begun an investigation of Chase’s treatment of the troops. "It was hard to believe that a financial institution in this country would try to take advantage of somebody on either active duty, military service or veterans," Miller told NBC News. The committee is conducting a hearing on Wednesday, at which a Chase official has been asked to testify.